I got an e-mail recently from an old classmate and AssataSAYS reader (as well as a few others) asking for tips on finding an apartment. I don’t know if any of you are aware of this, but I moved out on my own for the first time earlier this year. I figured since I was absolutely blessed with finding my place, I’d try to help any of you who are trying to move also. BTW, no, that isn’t my block pictured above. I found my place on Craig’s List. Yes, I had to sort through a ton of scams but there are some real sellers/lessors on there. You can check Craigslist.com but be smart about it. You may be able to find help with looking for an apartment on New York City’s site. NYC.gov has info on a lot of things happening in our great city, including places to live. 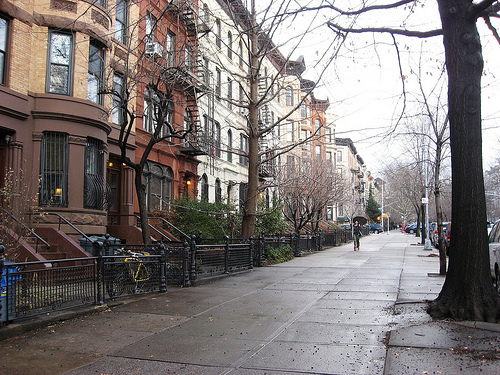 By clicking here, you can find a listing of affordable rentals in the 5 boroughs. You can see the listing of available rentals and how to apply by clicking here. Lastly, if you’re looking to move, tell EVERYONE! There is always someone, who knows someone else, who knows someone who’s moving out of their apartment or is looking for a new roommate. By no means am I a renting/home owning/housing expert, but I went through/am going through what some of you might be going through, too. Hope this helped! This entry was posted on Wednesday, April 14th, 2010 at 11:46 am	and is filed under LATEST. You can follow any responses to this entry through the RSS 2.0 feed. Both comments and pings are currently closed. I saw this blog through Facebook (someone posted it). After reading, I clicked “Like” and also shared it myseld. More power to you.